Sea Turtle Inc. released dozens of cold-stunned Atlantic green sea turtles back into the Gulf of Mexico Monday at Isla Blanca Park on South Padre Island as hundreds of spectators watched on. HARLINGEN — Some 50 sea turtles are warmed up and ready to go. 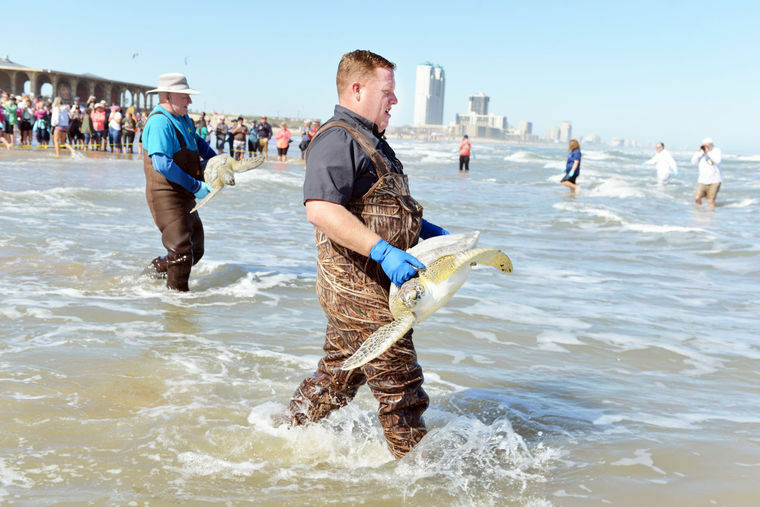 A cold-stunning event netted Sea Turtle Inc. on South Padre Island 50 sea turtles which have been rehabilitated at the center and will be returned to the Gulf of Mexico today. The release is open to the public and will occur along the gulf beach between the pavilion and the jetties at 1 p.m.
Just three weeks ago, 309 cold-stunned sea turtles were rescued by Sea Turtle Inc. and teams from Laguna Atascosa National Wildlife Refuge, Texas Parks and Wildlife Department, Texas Game Wardens and other volunteers along South Padre Island and Boca Chica Beach. When air temperatures drop suddenly in South Texas, the temperature of the shallow waters of the Laguna Madre can drop below 50 degrees. When that happens, the mostly juvenile green sea turtles enter a state in which they appear coma-tose, and become stranded and can’t make it back to warmer gulf waters. At that point, they are at risk of dying from exposure or predation. It’s been a record winter so far for cold-stunned turtles, with more than 2,500 cold-stunned green sea turtles rescued between South Padre Island and the Corpus Christi area.